My friend grew up in Nigeria before coming to the US for college. He says yams are life in Nigeria. Me: Do you still have family who farm yams? Me: Is there anything specific about how yams are farmed that makes them special? Analysis: Many cultures have some form of staple food. For the Irish, potatoes are an important part of sustenance, and therefore are a large part of how people live. 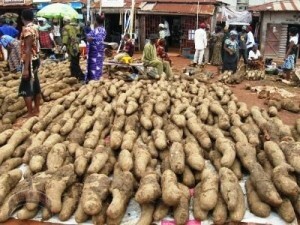 Because of this, a simple food like a potato, or yam, can come to have symbolic meaning. What a family produces in terms of yams, and how it relates to masculinity is extremely interesting, given that yams are an unpredictable measure of success. One year, the harvest could be plentiful and the weather perfect. The next year, however, bad luck could lead to very few yams. Another aspect of this folklore worth noting is that while the men do the initial farming, the women do the harvesting. Perhaps this relates to the hunter/gatherer trope, but a man’s worth relies on work which is half done by women.